Considering the successful history of the legal war room and the comfort level attorneys have with them, it is curious that more lawyers haven’t adopted the use of law firm business development (sales) war rooms. It seems a natural fit, but – as in other aspects of marketing – our industry lags behind. If we were to call on our industry’s version of HGTV’s “The Property Brothers” to convert one of these rooms into a business development war room, what would that look like and how would it function? The first step to redeveloping a piece of property is the build-out. Here’s what your space needs to be a proper business development war room. Provide as much security for the room as possible. As with any war room, confidential information will be out in the open, so you’ll want the room secured. 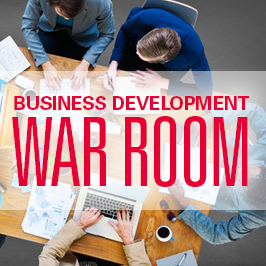 Your business development war room should be a dedicated room with a door that locks. It also should be located out of the general flow of firm and external traffic. Configure the room for productivity. The war room should be large enough to comfortably accommodate the business development team and configured for optimum productivity, with white boards, easels, Internet access, a computer and a printer. Provide a means to display visual aids that bring the team together around goals, assignments and progress. You can’t remodel without the right talent in place. Here’s whom you’ll need to get the job done. Business development: This should be a member of the business development or marketing staff who is knowledgeable about the team’s practice area and clients. This person will take the lead on developing the strategy, recommending tactics and following up with attorneys to support them. CRM/database: You will need access to the firm’s customer relationship management system to understand who in the firm has relationships with targeted prospects and clients; what types of services the firm has provided, if any; and what marketing tactics are currently being employed with respect to those targets. Depending on the connectivity of the billing, time and CRM systems your firm uses, you also may need someone skilled in producing reports from the billing system. Researcher: As you develop your targeted list of prospects and implement the marketing strategy for pursuing them, you need to understand what is happening in the industry and business of each targeted company, as well as any news about the individual contacts you are targeting. Be sure your team includes a staff member skilled in finding and analyzing this data, be that a marketing research analyst, member of the firm’s library staff or paralegal. With your room makeover completed and the team in place, it’s time to turn your focus to what goes on inside the room – the planning, implementation and tracking. Contact five prospective clients per month. Follow up with 10 existing clients per month. Add 10 new contacts to the firm’s newsletter mailing list each quarter. Give tactical implementation assignments to the team. Recognizing that attorneys occasionally and shortsightedly view legal marketing as a “non-billable, administrative task,” give members of the team simple, straightforward task assignments, such as “Attorney Joe will call contact Jane and extend a lunch invitation. Targeted date for call: March 4.” Have the business development staff member working with the team add the assignments to the attorneys’ calendars and include reminders. He or she also should make the attorney aware of other marketing efforts targeting the contact or the contact’s company. Ask the research specialist on the team to create a short dossier that includes recent news on the contact, their company and the relevant industry; a Dunn & Bradstreet or Hoover’s report; and any historical firm representation information. Get results through incentives. We all know that we get the behavior we want by tracking and rewarding that behavior. Include incentives for task completion and goal achievement as part of your war room strategy. While a business development bonus would be great (base it on achieving the tasks, not just on bringing in the new work), the incentives do not have to be significant enough to require approval by the board or compensation committee. Rewards can be something as small as a coveted firm-branded item, such as one of the nice golf shirts typically reserved for clients, a coffee shop gift card or a bottle of wine. Another motivational tool is a regular meeting with a member or members of firm management to make them aware of the progress being achieved by the team and individual attorneys. Track and report on progress. A member of the team, such as the CRM specialist, should be tapped to track progress. A progress report should be part of each war room meeting. Peer pressure often results in as much performance as do tangible rewards. Are you interested in using a business development war room or a similar approach to support a systematic business development program? Contact Terry M. Inser at tisner@jaffepr.com.